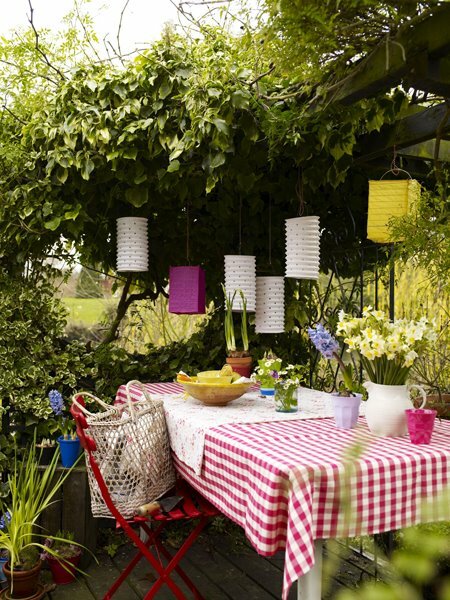 If your outdoor dining area looked like this, everyone would beg to be invited to your backyard dinner parties. You'd all dine under the dim light of strung lanterns and evening sky, with mismatched plates full of seasonal delights - garden tomatoes or juicy peaches or homemade jam spread on warm bread - whatever was in the house. And when everyone's palette was satisfied, there they'd remain, napkin in lap, just savoring good company and cozy surroundings. I want this backyard space. Love that pergola! Perfect for hanging adorable lanterns. I know, I want a pergola, too! lovely. fresh. all things summery. congrats on your 2 month blogiversary. it looks great. can't believe it is so young and so developed.